Three games down, 13 to go. Let’s breakdown the MVP race at the 18.75% mark of the season. 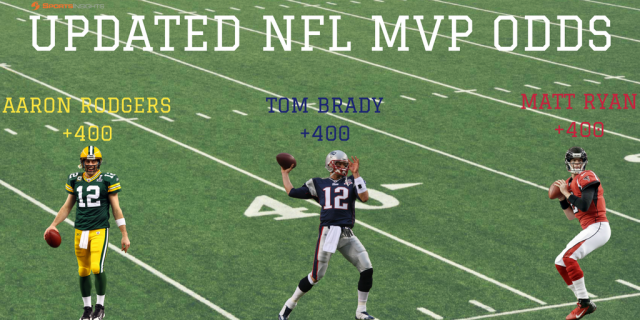 Perhaps the three best quarterbacks in the league…not sure who else you would make an argument for right now…are Tom Brady, Aaron Rodgers, and Matt Ryan. The Patriots are 2-1 and just barely beat the Texans, but the defense can be blamed for that. Tom Brady’s 1092 passing yards lead the league by more than 100 (over Rodgers), his eight touchdowns lead the league, and he has yet to throw an interception. I think he may be on to something with that TB12 Method of his. Rodgers and Ryan aren’t off to terrific starts, but they both belong to be right up there with Brady. We all know Rodgers will end up with terrific stats and a playoff team. Meanwhile, it’s tough to tell whether Matty Ice is as good as his numbers last year suggested, but the Falcons are one of just two undefeated teams remaining. If they can come away with the top seed in the NFC, he won’t need to put up a 117 passer rating to repeat as MVP. Chiefs rookie RB Kareem Hunt continues to improve his odds, as he and his quarterback Alex Smith are both 14/1. Hunt is running away (ha…get it) with the rushing crown, as his 401 yards on the ground are over 100 more than the next best guy (Dalvin Cook, another rookie). A few of the preseason favorites who haven’t done anything to help themselves so far are Big Ben, Russell Wilson, Ezekiel Elliott, and Cam Newton. If you put money on them before the season began, you might want to start counting your losses. Not much love for old Joey Flacco after the Ravens showed Europeans how to not play American football. While he’s “elite” in his own right, Flacco threw for just 28 measly yards on the pitch at Wembley…downright pathetic. If you gave an average high school QB 18 pass attempts with NFL receivers, would they be able to eclipse 28 yards? Maybe? Will any of these top three distance themselves from the pack? Will someone else make a push for the top? Find out in next week’s update.